We mentioned The Alban Arts Center production of “The Wind In The Willows” last Sunday, but we now have video clips of the actual cast. Above you will see a clip I put together using some rehearsal footage. After the jump you will see some very clever clips directed by Austin Sussman, starring Daniel Caldwell as Mr. Toad, having some apocryphal adventures. 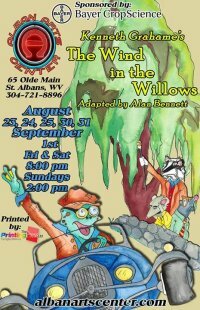 “Wind in the Willows” opens at 8 PM Friday and continues Saturday and Aug. 30-31 at 8 PM, and at 2 PM Sunday and Sept. 1. The production, adapted by Alan Bennett from Kenneth Grahame’s beloved children’s tale, is staged in an “audience in the round” setting, with the action taking place on three sides of the audience. The show stars Kyle Casto as Mole, John Johnson as Badger, Loren Allen as Rat and Daniel Calwell as Mr. Toad, along with a large cast of talented young performers. The Alban Arts Center is located at 65 Olde Main St., St. Albans. Tickets are $15 for adults and $10 for seniors and children 12 and under. Reservations are highly encouraged due to limited seating. Call 304-721-8896 or visit www.albanartscenter.com.